Well over 200 women were treated to fine dining, an attentive wait staff and a story of meeting life’s challenges head on last week. The Elgin Knights of Columbus hosted their annual “Da Ladies Nite Out” on April 8. Guest speaker for the evening was Jill Junck of Randolph, NE. Jill has lifelong ties to Elgin as her mother, Janice Mollhoff, is the daughter of the late John and Irma Hoefer of Elgin. When Jill was growing up in Tilden, she surely had all the usual dreams of adulthood that little girls have. She would meet her Prince Charming who would sweep her off her feet, have a career where she enjoyed going to work every day, live in a house with a white picket fence, she would have perfect little children who never got their clothes dirty or sassed back to Mom and Dad. She got her Prince Charming when she married Scott Junck in 2003. She loves her job as a Registered Nurse at Faith Regional Health Services in Norfolk. It may not have a picket fence but she is loving life on the farm just south and east of Randolph. Her three boys are sweet as could be and perfect – perfect for her and Scott. One could say Jill is living the dream but, unlike the fairy tales, life isn’t “happily ever after”. 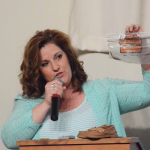 Life is full of high’s and low’s, proven as Jill shared her story to the people in attendance. She opened the evening with a recent true story that seems to sum up her life over the last seven years. The Juncks were blessed with their first child, a son Chase, in 2006. Jill, like most first-time moms, had the usual fears and doubts about leaving her baby in someone else’s care. “I was very apprehensive to let anybody take care of him. My friend Amy would tease me, ‘you’re going to have to let go of him sometime,” she said. When Jill first went back to work, her husband Scott watched him. “It worked until he was going to get into the field and he said ‘he can’t be with me all the time’”. Scott’s younger brother had a child with his girlfriend and she was taking care of their child at home so it seemed a perfect opportunity for both families. Everything seemed to be falling into place. Its often said that when life seems to be going smooth, that’s when that ole bad luck raises it’s ugly head. For the Junck’s, bad luck paid a visit the day they received word that Chase was suddenly unresponsive at the babysitter’s, March 19, 2008. “The day I got the worse phone call of my life, at work” says Junck. “Scott called me and said (she) just called and Chase wouldn’t wake up. Not normal for a fifteen-month-old to not be able to wake up. I asked him ‘what’s wrong?’ He said ‘I don’t know yet, I’m on my way. She’s trying to call me’ so I hang up so he can talk to her. We eventually are speaking again. He said ‘Chase doesn’t look good, he doesn’t look normal. He’s barely breathing, he doesn’t look okay.’ By then, paramedics had (been) dispatched and (were) there and they’re saying they don’t think he’s going to be okay. I’m at work and I’m already hearing our Lifenet helicopter take off. I know who thats for.” Chase was flown to Mercy Medical in Sioux City, IA. Significant brain bleeding and subsequent swelling required that a bone flap (a cut in the skull bone and removal of bone) be made to allow for the swelling. Over the course of several days his head would swell so badly that his face became featureless. Also, during those critical first hours, Chase had coded (his heart stopped beating) twice. Those days were tough emotionally and mentally on the family. After his initial treatment at Mercy, Children’s Hospital in Omaha accepted him as a patient and MercyAirCare transported him with crew member ‘Kevin’ promising Jill that he wouldn’t let him die. Before the flight left for Omaha, Jill was given a hazmat baggie with a clipping of Chase’s hair so she could keep a part of him with her. Chase didn’t look good and he was given only a 20% chance of surviving. “We prayed and prayed and prayed from the time it happened, well, we’re still praying today,” she said. “I’m almost ashamed of it at times, what I prayed for that night. But from what Chase can tell us now, maybe not.” What did she pray for? “I made what a thought was a deal with God, that if Chase can’t have a good life, if he can’t have a good quality life, to take him that night. Don’t make him suffer, don’t make him hurt, just take him then”. Morning came and Chase was still with them. At that time, they committed themselves to do absolutely everything they had to do to help him have that good life.